I love soups. As long as you can puree them, you can make soup out of any vegetables. 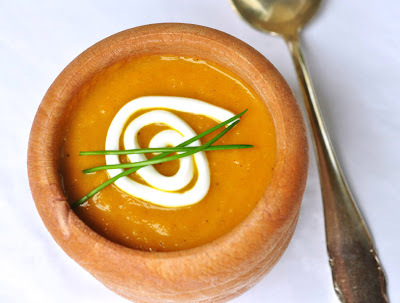 I usually like my pureed soups with a lot of fancy twists. However, we got a little bored of the regular carrot soup that we had for years. I noticed it as I hadn't made it for ages. Well, a little twist might rekindle our love to carrot soup, I thought. Curry and coconut milk are the "secret" ingredients here. I liked the fact, that I could make this soup quite spontaneously (read: without planning it). I had all the ingredients for a regular carrot soup at home, and while cooking it decided to spice it up. That was easily done as curry powder and canned coconut milk are staples in our kitchen. The soup is quite sweet due to the carrots and the coconut milk. If you like it a little hotter, add some chilli powder. In a deep pan, heat olive oil over medium heat. Add chopped onions and ginger and fry until onions become golden. Stir in curry powder and fry for another 2 minutes. Add carrots and fry for 2-3 minutes. Pour in vegetable broth, bring to boil. Put a lid on and let simmer for about 15 minutes or until carrots are cooked. They should be very soft. Take off the heat and let cool a little. Puree the soup. Put back in the pot. When reheating, add the coconut milk. Season with lime juice. Garnish the soup with more coconut milk, creme fraiche and fresh chives. Serve immediately.